It is time to examine our first structural element: and axial loaded member. Axial loaded members go by many names in engineering. These names are often related to the direction of loading (tension or compression) or the nature of the structure (flexible cables, coiled springs, etc.). 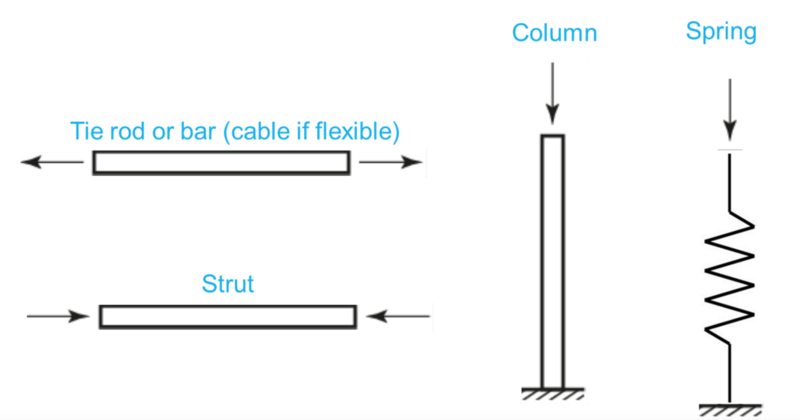 Some of the most common structural elements are shown below. In this course, we will limit ourselves to axial loaded members that primarily deform in a 1-Dimensional manner (ie: change in length). This necessitates that the cross-sectional dimensions of the member are small compared to the overall length. This unit will first focus on examining the deformations and stresses associated with an axial loaded member. In addition to looking at axial loaded members, the concept of statically indeterminate problems will be introduced and you will learn the solution approach to such problems in the context of structures comprised of axial loaded members. Relate the stress and strain distribution in an axial loaded member to the observed resultant deformation. Derive the force-displacement relationship for an axial loaded member. State and explain St. Venant’s principle. Identify if a given problem is statically determinate or indeterminate. Apply the generalized procedure for solving a statically indeterminate problem involving axial loaded members.